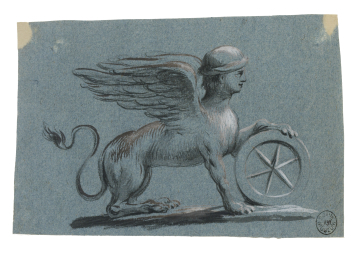 Record drawing of a seated winged lion with a human head resting one of its front paws on a spoked wheel. You are here: CollectionsOnline / Record drawing of a seated winged lion with a human head resting one of its front paws on a spoked wheel. The compositions in Adam vol.26/138-40 and 142 are all part of a set of drawings on blue paper, which are probably copies after antique gems or cameos.